The concept of TIA emerged in the 1950s, with the observation by C Miller Fisher, and others, that ischaemic stroke often followed transient neurological symptoms in the same arterial territory. Like ischaemic strokes, TIAs are due to locally decreased blood flow to the brain, causing focal neurological symptoms. 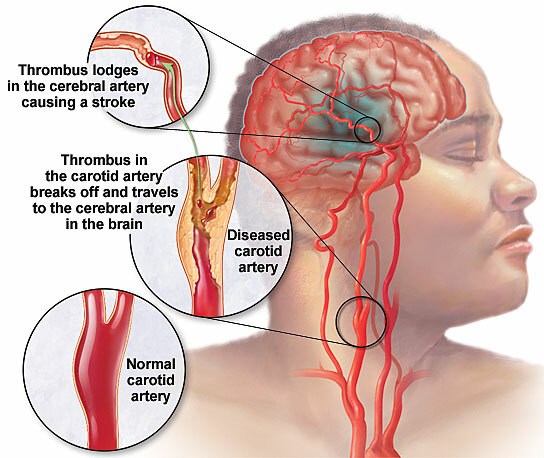 Decreased blood flow results from either embolism into a cerebral supply artery (from the heart, or the great proximal vessels, extracranial or intracranial arteries, usually affected by atherosclerosis), or in situ occlusion of small perforating arteries. Resolution of symptoms probably occurs by spontaneous lysis or distal passage of the occluding thrombus or embolus, or by compensation through collateral circulation restoring perfusion into the ischaemic brain area. Internationally, the probability of a first TIA is around 0.42 per 1000 population in developed countries. TIAs occur in about 150,000 patients per year in the United Kingdom. The incidence of TIAs increases with age, from 1-3 cases per 100,000 in those younger than 35 years to as many as 1500 cases per 100,000 in those older than 85 years. Fewer than 3% of all major cerebral infarcts occur in children. Paediatric strokes often can have quite different etiologies from those of adult strokes and tend to occur with less frequency. The incidence of TIAs in men (101 cases per 100,000 population) is significantly higher than that in women (70 per 100,000). Clinical manifestations will vary, depending on the vessel involved and the cerebral territory it supplies. A TIA may last only minutes, therefore symptoms have often resolved before the patient presents to a clinician. Thus, historical questions should be addressed not just to the patient but also to family members or friends who were present at the time of TIA. Witnesses often perceive abnormalities that the patient cannot, such as changes in behaviour, speech, gait, memory, and movement. The main diagnostic challenge of TIA is that the symptoms and signs have usually resolved by the time of assessment. There is no test for TIA: the gold standard remains assessment as soon as possible by a clinical expert. The diagnosis relies heavily on the patient's account of their history and on expert interpretation of that history. Interobserver agreement for the diagnosis of TIA between different stroke-trained physicians and non-neurologists is poor. ↑ Estol CJ (March 1996). "Dr C. Miller Fisher and the history of carotid artery disease". Stroke 27 (3): 559–66.